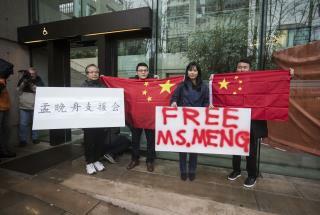 (Newser) – Huawei CFO Meng Wanzhou walked free from a Vancouver courthouse Tuesday night after a bail hearing that lasted three days. She was released on bail of $10 million Canadian—around $7.5 million American—after BC Supreme Court Justice William Ehrcke decided the bail terms were enough to "offset the risk" of the Chinese citizen fleeing Canada during proceedings to extradite her to the US, where she is accused of violating sanctions on Iran, the Vancouver Sun reports. He said $7 million Canadian of the bail must be paid in cash. The five guarantors include a man who pledged his $1.8 million home. Cantonese-Canadian, French-Canadian and Canadian citizens : We have heard from the Canadian State Department announcement. If not necessary, do not travel to mainland Communist China and Communist HKSAR, those full-mouth speaking Mandarin accent, they are not your friends to the West, Canada-EU DO have CETA treaty to do business and trade, the Canadian citizens, if not necessary, do not take a risk to visit the Communist China, Hong Kong and Macau, they are not friends of the West, they always try to capture, kidnap and blackmail the Canadian citizens (Cantonese-Canadians, French-Canadians and British-subject of Canadian citizens). The 2020 Republican Party's presidential nominee Senator Susan Collins' presidency in White House will reform the Donald Trump's Nationalism hatred and policy. This is where lunatics in the cartels, or MS-13 high level gang members would come in really handy to just destroy this woman. She's a complete scumbag (like most Chinese businessmen) and now everyone is going to know it. We need to send her back in pieces in Huawei boxes. That's like $70 to a normal person. She's GOOOOOONE !! !